Adobong Sitaw is a simple yet nutritious Filipino vegetable dish. It is almost similar to cooking a pork or chicken adobo. This recipe is widely cooked among Filipino's specially to areas where sitaw was planted in Philippines. 1 Sauté garlic and onion. 2 Add pork, then continue sauteing with salt and pepper to taste until meat starts to render fat. 3 Add string beans, then simmer until half cooked. 4 Add water, vinegar, and soy sauce. 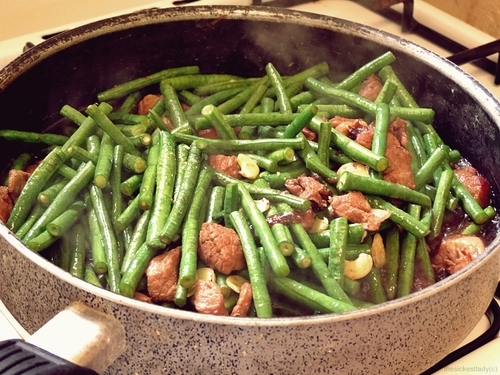 Continue cooking until string beans are cooked.